No other group of people, through all time, could be so described. Their experience is what sets the 144,000 apart as special. Through daily self-surrender to their Redeemer, the 144,000 have been purified and refined. Their characters have been molded and fashioned after the divine similitude and they perfectly reflect the divine image. They are one with the Father and the Son. 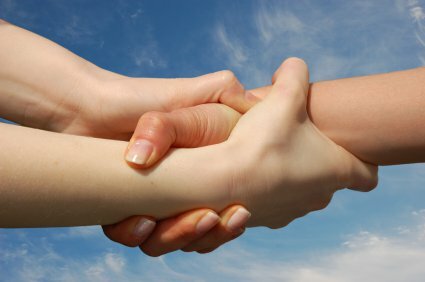 Their thoughts, their likes and dislikes, their motives and goals are one with the divine. They are complete in Him. The 144,000 are described as “virgins” because they have a pure faith. Satanic lies and false doctrines have been replaced in their hearts by the pure truths of Heaven. No guile flows from their mouths. Rather, their words, like those of the Saviour’s, are a savor of life unto life. Because of their full surrender to the will of Yahuwah, they are One with the divine mind and will. Therefore, it is their highest honor and privilege to “follow the Lamb withersoever He goeth” throughout the universe and for all eternity. Following the Lamb does not begin in Heaven, however. In order to have the honor of following the Lamb in Heaven, they began following Him on earth. For nearly 6,000 years, the energies and resources of Heaven have been focused on bringing light and truth to souls perishing in ignorance and sin. While on earth, the 144,000 coöperated with Heaven in the salvation of souls. They shared Yahuwah’s love for sinners and put forth self-sacrificing efforts to bring the truth to others. 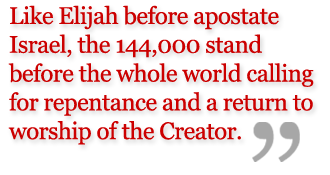 In this work, the 144,000 are the anti-type of Elijah. Elijah’s work was a symbol of the work done by the 144,000. In a time of grave national peril, Elijah stood alone before king and commoner, calling for repentance and a return to the worship of the Creator. He presented life and death to the people, and urged them to choose life. This is the work of the 144,000. Scripture reveals the final struggle will be over when to worship, because when one worships reveals who is being worshipped. Like Elijah before apostate Israel, the 144,000 stand before the whole world calling for repentance and a return to worship of the Creator on His seventh-day Sabbath determined by the luni-solar calendar of Creation. The 144,000 share the Saviour’s love for souls. 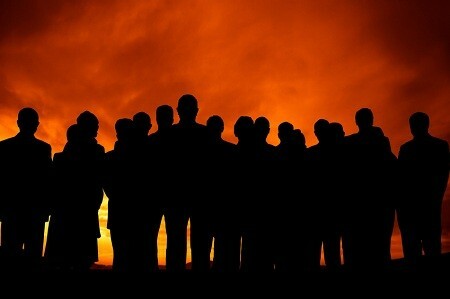 They are co-laborers with Yahushua in the salvation of souls. The 144,000, by full surrender of self, enter into a relationship with the Saviour more intimate than anyone else can share. As Yahushua is the Second Adam, they are the Second Eve, the bride of the Lamb. As the Spirit of Yahuwah moves on hearts to bring them to repentance, the 144,000 as the bride of the Lamb, join their voices with His, urging all to repentance and obedience. This is not a restrictive command, dictating that the 144,000 will not be allowed to leave the immediate presence of Yahuwah. Rather, it is a statement of their privileged status: the 144,000 always have immediate access to the Father’s presence. With the redeemed of all ages, the 144,000 are given the right “to eat from the tree of life.” (Revelation 2:7) They receive their own “crown of life.” (Revelation 2:10) They are given “a white stone, and on the stone a new name written which no one knows except him who receives it.” (Revelation 2:17) This new name is a reflection of what their individual characters have become under the polishing and refining of the divine Purifier. The destiny awaiting those who have followed the Saviour on earth is the honor and privilege of following Him forever in the courts above. While the 144,000 are a special group, it is not an exclusive group. 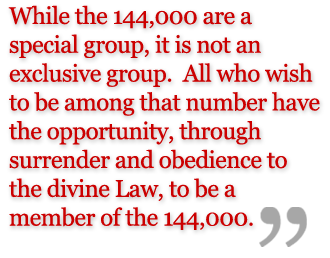 All who wish to be among that number have the opportunity, through surrender and obedience to the divine Law, to be a member of the 144,000. This is not done through any “works” they perform. None who sing the song of Moses and the Lamb will claim to have gained Heaven by their own merits. The 144,000 are the bride of Yahushua because they have surrendered their will to His; they have trusted all of the promises. They have become strong in His strength; His righteousness is theirs. Surrender to the Saviour today. Follow Him today, tomorrow . . . and forever.